Barron Mamiya at picture-perfect Pipeline during his early morning Round 1 heat. 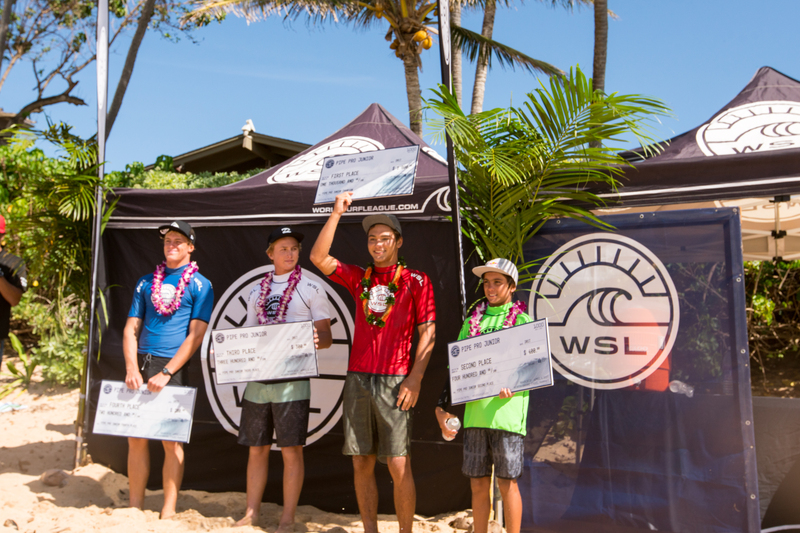 Haleiwa, Oahu, HAWAII – (Wednesday, March 22, 2017) — In one of the most historical Pro Junior moments ever, Barron Mamiya (North Shore, HAW), 16, took out his third consecutive victory at the World Surf League (WSL) Pipe Pro Junior today in flawless, 3-5′ foot barreling surf. The event featured electrifying performances with some of the highest scoring and greatest conditions ever witnessed in a junior competition, all taking place at world-famous Pipeline on Oahu’s North Shore. “I love Pipe, I’ve always wanted to win here,” said Mamiya in a post-Final interview. “This has to be the best win for sure.” Fresh off another first-place success at the Papara Pro Junior in Tahiti – which followed his first professional victory ever at the Sunset Pro Junior in January – Mamiya is on an undeniable winning streak. “I’m stoked, I worked hard last year and I didn’t really do a lot of comps, but I’d like to thank Sean (Ward), he’s always down here and comes out, and Joel (Centeio),” he said of his two Hurley coaches. “I’m psyched and all my boards have been good and I’m stoked. Today’s win all but locks Mamiya’s commanding lead on the regional junior ranking and secures him a place in the 2017 World Junior Championship. With one final junior event left in the WSL Hawaii/Tahiti Nui region, the Turtle Bay Resort Pro Junior in October, Mamiya has cemented his spot at the top. Near-perfect 9-point rides were dropping left and right throughout the day, but the most impressive scores came from third place finisher Finn McGill (North Shore, HAW), 16, who nailed a perfect 10 in the Final, plus a 9.60 and 9.35 in the second Semifinal for the highest heat total of the event, an 18.95 out of a possible 20. Young gun Eli Hanneman (Lahaina, HAW), 14, had an impressive Runner Up finish while Cody Young (Makawao, HAW), 18, nabbed a respectable fourth place. It was Maui against Oahu in the 30-minute Final with Mamiya and McGill representing the North Shore and Hanneman and Young hailing from the Valley Isle. Hanneman, the youngest finalist, set the bar with a 7.75 after a steep drop, barrel and blast out of a left-handed ride. Whales played along the outer reef as competitors and spectators awaited another set on the horizon and it wasn’t long before competition fired back up and Mamiya and McGill split a peak. McGill went right on a long freight train for a perfect 10 from the judges, and Mamiya left for an 8.35. Young took off on the second wave of the set, stalled, drove down the line and was spat out of the barrel for a notable 9.50. Midway through the heat, Hanneman got a water patrol ride to shore for an equipment change, but was back out within minutes and chipping away with in-and-out barrels at Pipe. With five minutes left on the clock and anticipation rising, Mamiya snuck a Backdoor barrel under priority for a 7.90 and the win, as competitors were left without the backup waves needed to overtake his lead. The second highest single wave score of the day, a textbook 9.90, went to 15-year-old Wyatt McHale (HAW) for a cavernous Backdoor barrel. Contest organizers will reconvene tomorrow morning to make a call for the Wahine Pipe Pro at 7am local time. First to hit the water for the women will be defending event winner Mahina Maeda (HAW), Leila Riccobuano (HAW), Julie Nishimoto (HAW) and Kyana Rowland (HAW). The holding period continues until April 3, but with a good forecast for the rest of the week, back-to-back competition days look likely. The forecast calls for 5-8ft. surf and an easing WNW-NW swell with moderate easterly trades tomorrow. Please visit WorldSurfLeague.com for more information. Surfers listed 1st through 4th, all athletes from Hawaii unless otherwise noted.